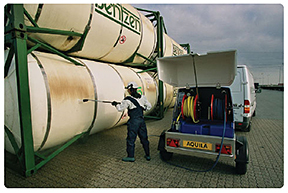 With over 25 years of experience, Tensid UK Ltd is your trusted name for professional and industrial pressure washers. 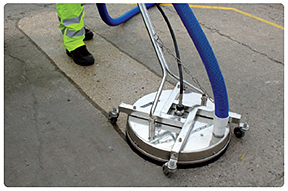 Tensid supplies high-performance hot water pressure washing equipment that is designed to meet all your professional requirements, backed by reliability, top-notch customer service and technical support. Call 01932 564 133 or email info@tensid.com for pricing and orders. 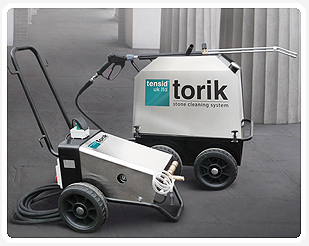 TORIK Stone Cleaning System Tensid’s TORIK Stone Cleaning System meets the most discerning specification requirements while being portable and efficient.TORIK’s high pressure superheated water and steam quickly removes grime, moss, algae, fungi and many other types of soiling. The temperature and pressure is fully controllable. A ceramic nozzle creates a precise fan-shaped cleaning edge that is tough on grime but gentle on sensitive stone surfaces. 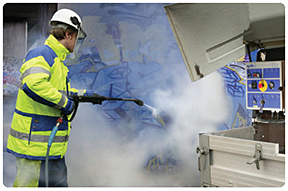 TORIK works together with TAVEC 201 for a complete paint removal solution. 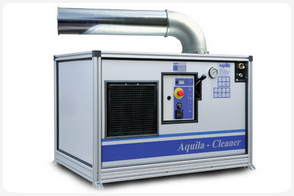 Tensid is the UK supplier of Aquila pressure washers for hot or cold water pressure cleaning. Available as trailer or van mounted; and, diesel, petrol or electric powered. 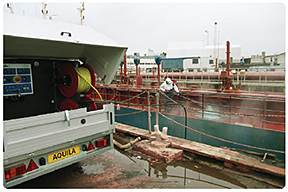 Pressure washers are available in various combinations from 130 bar up to 1700 bar maximum pressure and 100 litres per minute maximum water flow. All pressure washers are built ready for immediate use. Tensid is able to build bespoke machines which match customer’s requirements. Although we feature standard models on our web site we are happy to discuss your specific needs. Tensid provides a comprehensive and friendly pressure washer maintenance service and repair facility with fully qualified technicians.